This is labeled as a Burgundy Sour Ale Aged in Oak Barrels, and digging into matters, I see that batch 1 was a blend of beers aged in French Oak barrels, some for 2 years, some for 1.5 years (I assume this bottle of batch 2 had a similar provenance). Were these old Burgundy wine barrels? Or is the Burgundy just a reference to the color? Perhaps a take on the Flanders Red style? Maybe I should just drink this stuff and worry about it later? But it is later, what now? Interesting (or lame and pedantic, take your pick) sidebar, I recently saw something that claimed the Flanders Red style was known as the "Burgundy of Beer". Given the above conundrum about why this beer is called a Burgundy Ale, I thought I should check this out. After an exhaustive 2 minute search, I found that the Burgundy of Beer could be: the beers of Bavaria, dubbels, Lambic/Geuze, and yes, Flanders Reds (with Rodenbach Grand Cru generally garnering the title). There's probably a case to be made for all of these (some better than others), but seeing as though I have no real experience with Burgundy wine, I'll just not assume what I heard on the internets is true. Beer Nerd Details: 6.5% ABV bottled (375 ml waxed cap). Drank out of a flute glass on 5/24/14. Vintage: 2013/Batch 2. Not quite a world beater, but it's close, and some of the variants sound absolutely wonderful (Cherry Origins anyone?) Jay has recently sworn off sours and the likes of Cantillon and Crooked Stave, which is liable to get him branded a monster in some circles, but me, I'm just happy there'll be more of this stuff to go around. This page contains a single entry by Mark published on May 27, 2014 10:23 PM. 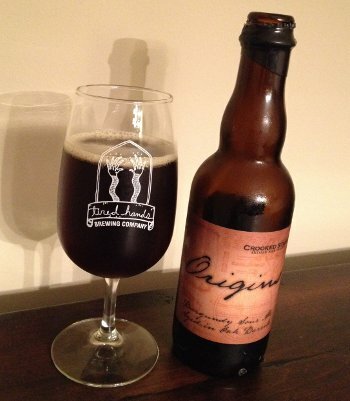 Lavery Rum Barrel Aged Imperial French Ale was the previous entry in this blog. Stone Fyodor's Classic is the next entry in this blog.